The basic form of a national building typology is a set of example buildings which are selected because they are very common in the respective country. An example building consists of a physical definition and a photograph of an actual existing building. The example buildings are classified by construction period and building size. Furthermore supply systems are defined which are common for the respective example building. The defined building types are used to demonstrate the possible energy savings by applying refurbishment measures. The pre-calculated examples can be disseminated by brochures or by online information platforms. The primary target groups are house owners. Referring to the appearance and the details of an actual existing building proves the feasibility of the measures and creates the necessary confidence. In case of energy advice software applications the building types are usually just a starting point. They can easily be adapted to some basic features of the real building, for example to consider the variety of geometrical forms. But also in the case that the real building was already modernised by e.g. wall insulation of a certain thickness the typology "showcase" building may be modified in the same way (for energy balance calculation within the software) to draw a more realistic picture of the actual building. 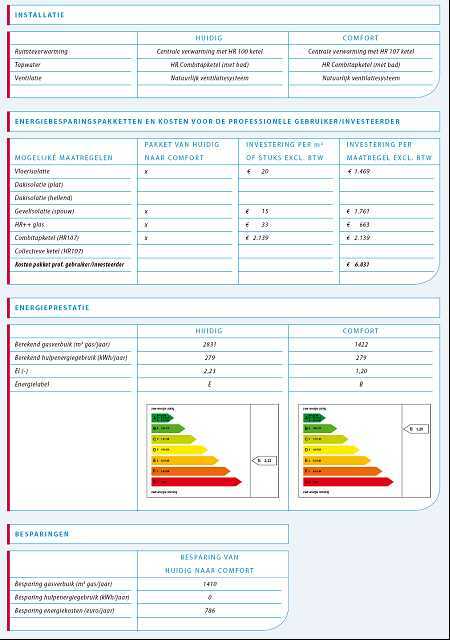 Also the design of energy performance certificate procedures can be improved by typological aspects which allow simplifications of data acquisition: Instead of the investigation of a large number of building details (e.g. thicknesses and materials of construction layers, lengths and insulation of heat pipes) global values are used which represent typical cases. The starting point is the existing building typology in form of “example buildings”. In order to form a building stock model it is necessary to determine frequencies for each building type. Since the statistical information is not always available on the required level of detail (see chapter Error! Reference source not found. “Error! Reference source not found.”) an allocation on the basis of reasonable estimations is possible. 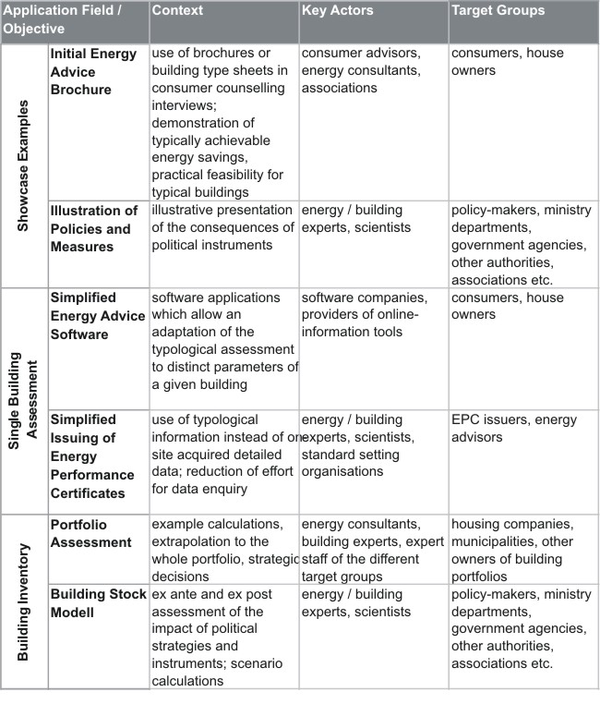 The elaborated set of example buildings can be used directly as a building stock balance model. But it is also possible to merge different classes and derive a small number of “average buildings”. As a consequence the implementation of scenario analyses – which implicates the variation of a number of different parameters (e.g. insulation measures, supply systems) – is much more easy. The quality of the building stock model can be improved by empirical enquiries or – if available – by analyses of a database containing datasets of all buildings of the considered building stock. Possible analyses are the determination of average envelope areas, frequencies of construction types (materials, thicknesses), supply systems or frequencies of refurbishment measures by building type.